Simply put -- THESE THINGS ROCK! The MOC 7's are a great choice for slalom racing setups. All our SK8KINGS Completes come equipped with Oust Moc Series Bearings and we strongly recommend their use with our wheel line for the smoothest, fastest ride possible. Invest in the best! EXTRA VALUE: Don't forget to protect your new set of Oust Moc 7's with Oust Speed Lube. Add on above and protect your investment. 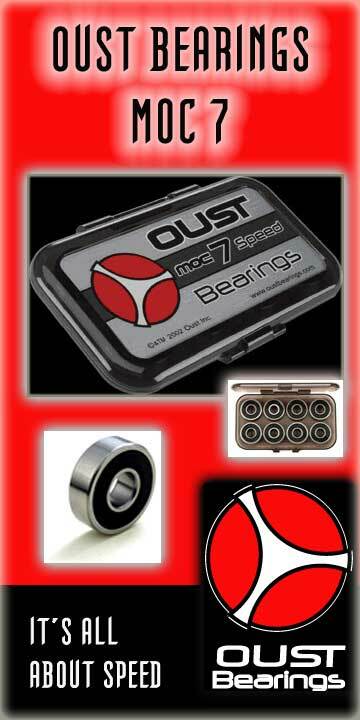 The Oust MOC 7 Speed bearing was designed specifically for speed and manuverability under extreme skateboard conditions. After hundreds of hours of research on vert, technical, street and slalom, the problems and the needed solutions were realized.